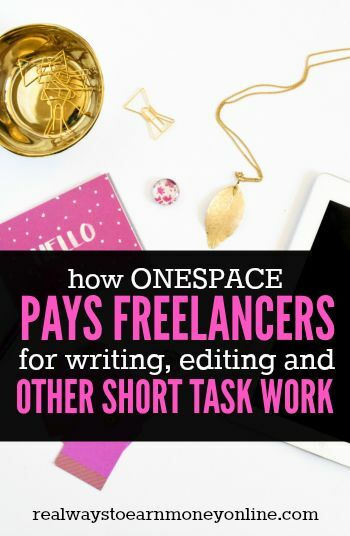 Short Tasks & Writing/Editing Jobs at OneSpace – Fast Pay! Published March 14, 2014 By Anna T. This post may contain affiliate links. Regardless, I only recommend sites I've researched and/or used and trust. OneSpace is a company that was recently known as CrowdSource. This company hires home-based workers to do short tasks as well as writing and editing jobs. Some of you may already be familiar with the company thanks to the many different tasks they posted in the past at Amazon Mechanical Turk. I know I've seen them and done a few on there myself. The work you do for OneSpace is now done directly through their website. As mentioned above, you can do short tasks like image tagging, transcription, and website categorization — easy things that don't take much time. As mentioned above, they also have occasional writing and editing jobs, but they may not always need help for those. The writing and editing jobs are larger projects that pay more. The pay for the easier tasks is low, usually not more than .10 cents each. For writing, OneSpace pays between $0.02/word and $0.035/word. The company pays via Paypal. Also, they pay fast — typically within 24 to 48 hours after your work is approved. These types of opportunities are the sort of thing you wouldn't want to count on for paying all your bills because the pay will be on the lower side. If you're just starting out doing tasks for OneSpace, I'd think of it as extra money or a work from home “egg” to have in your basket. However, It could definitely come in handy if work dries up with the other sites you use, especially since you can get payments so frequently. There are some reviews posted at Glassdoor you may want to check out, although notice before you read them which ones are coming from people working in-house and which ones are coming from home-based workers. To get started, you just go here and follow the instructions to sign up. Good luck! This is the most profitable route to take as a freelance writer. You can get your own clients and set your own rates, which you cannot really do with OneSpace or other content sites. A six-figure income is not outside the realm of possibility when you're running your own business.